Reminder: Vegetarian Tuesday is still on! Fact #3: “Humans are natural herbivores; we get heart disease when we eat meat.” – Dr. Ong Hean Yee, head of cardiovascular medicines, Khoo Teck Puat Hospital. Literally, vegetables save your heart from breaking! Wah piangz oei, Wise Guy neh follow his Vegetarian Tuesday last week; he ate meat for dinner, so today, he wanna torture me to bring me here to make up for his meat dinner. Why should I follow him? Suffer with him? WHY WHY? Everyone sing high praises of DeliVeg so we go lor. DeliVeg has changed the name to Thousand Veggie because there is a new partner added in but everything is the same, only name change. The decor very obiang leh, I like. Red and black and plasticky. A wall that shows people praying, and the words say, “People are praying for you to be vegetarians” or something like that. And Wise Guy hated the stench of oil in the air, very stuffy, like long time never ventilate. Wise Guy used the word “miasma,” dunno what that is lah. I ah beng. I go toilet, and ask Wise Guy to order for me. He ordered Claypot Rice ($8), Yakitori bento ($9.90), homeland tofu ($12), cereal prawns ($12), and a glass of watermelon juice ($3) and a glass of pineapple-ginger juice ($4). 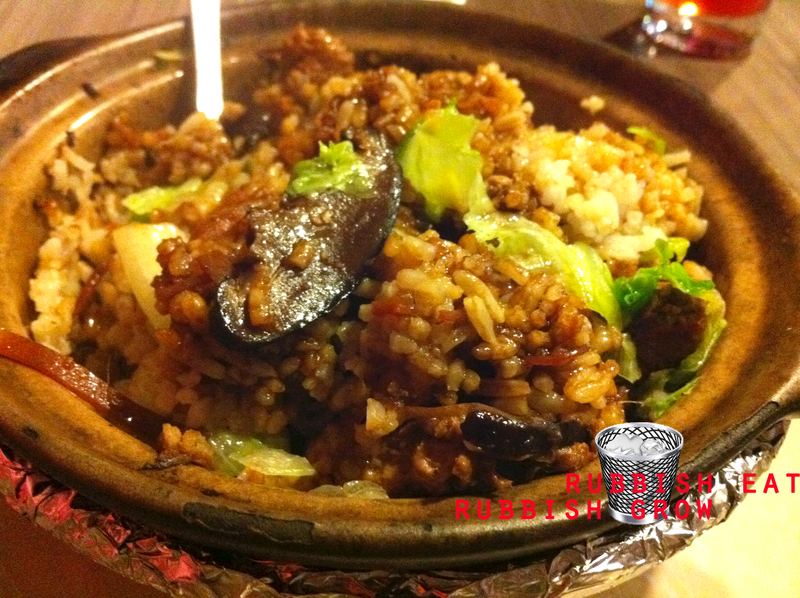 The claypot rice had the slightly burnt rice at the sides, which is the way claypot rice should be, and was tasty. The yakitori bento, bo hua leh, most of it is rice, just two sticks of mock meat, which tasted more like braised tofu than meat, but it was springy and tasty. 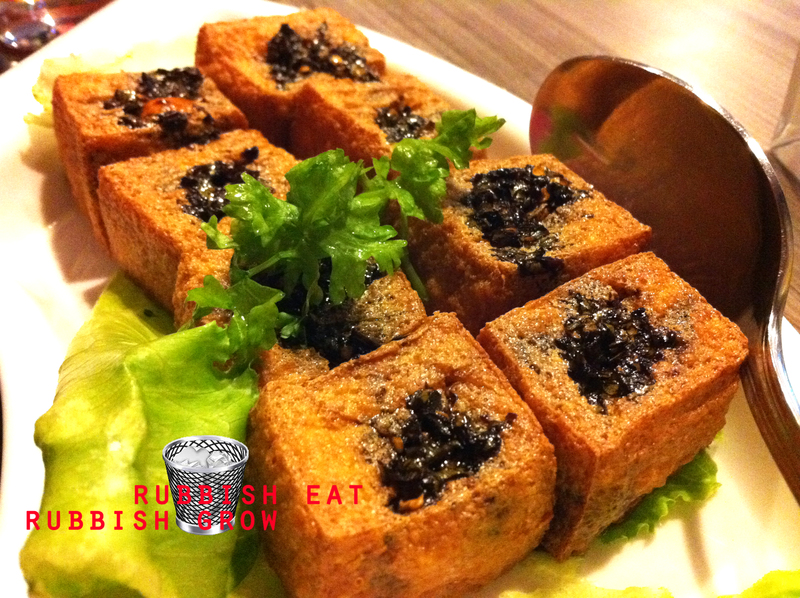 The homeland tofu (家乡豆腐) is just fried tofu with with pickled vegetable on top. There was a slightly spicy taste to it. But really, nothing special, and a bit expensive – $12 for 8 pieces. 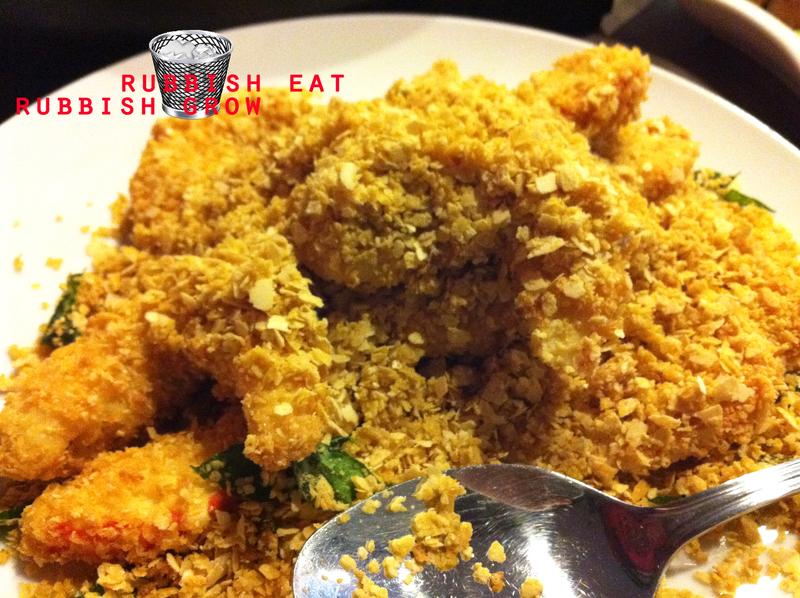 The Cereal Prawn, another specialty of the shop, tasted like battered stale fish, not springy, with a dense texture. Also, not worth the money. Wise Guy got violently unwell after meal. Weak, man. He wanted to puke, feeling cold inside, sore throat all of a sudden, light headed. We had to leave the place and he had to rest for an hour to recuperate and feel better. Maybe it’s the lack of ventilation? Overall, there is a variety of cuisines here, from fish and chips to claypot rice. But most of the dishes were deep-fried and not very healthy. The air seemed bad too. 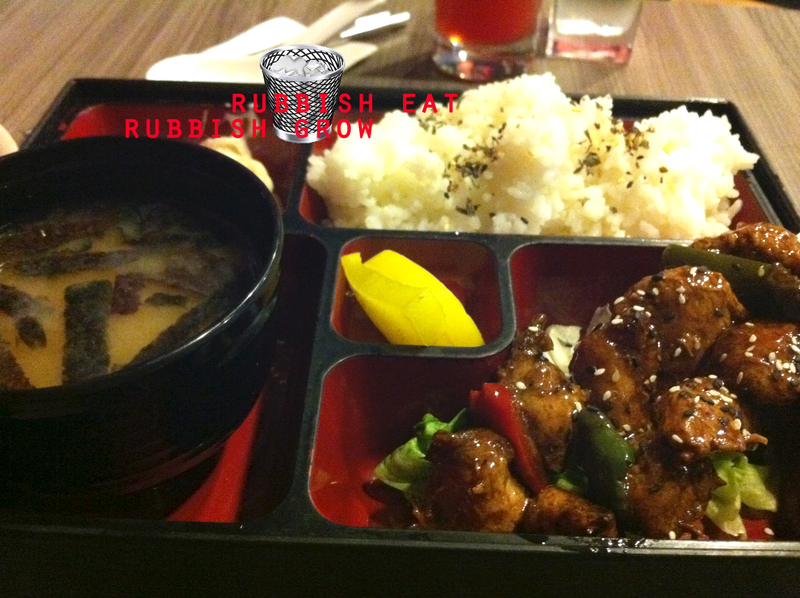 The dishes range from average to bad and the price is quite expensive for vegetarian dishes. If you’re in C-town, you might as well walk a corner to NutriHub which provides a better, healthy, cleaner, cheaper alternative.